In Senegal, a traditional greeting between two strangers first requires an exchange of last names. After that, each person speaks in short sentences that express wishes for good health and well being to the other person and their family. It is important, however, that each sentence include the last name of the addressee. The exchange can go on for a while with the mutual understanding that the more time spent making introductions and repeating last names, the more respect is shown and the more ties are created between the families of the two individuals. 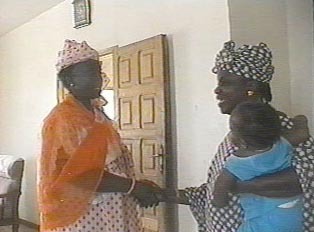 This traditional greeting always takes place in Wolof, with an occasional phrase in Arabic wishing the other person peace and good health. Men giving a traditional Senegalese greeting shake hands, whereas in the most traditional mode of greeting there is no physical contact between women. However, it is also not uncommon to see women shaking hands when one ofthe greeters wants to show respect to the other. "Genuflexion" which is afrench word meaning "slight bending of the knees" is also regarded as arespectful greeting. Beyond the standard etiquette people may decide togreet differently with relatives or close friends, which is the case inthe image in the upper right of this page. The women know each other very well and thus hold on to each other's hands while greeting. Younger generations generally have much quicker and less formal greetings in French with an occasional bit of Arabic. Younger people are less interested in using the time to establish a relationship and prefer to quickly move on to the body of the conversation. However, when a younger person greets an elder, the younger will do his or her best to participate in a traditional and more time-consuming greeting, but it will rarely be as elaborate as between two elders. A traditional Senegalese farewell takes place in Wolof and involves sending regards to each individual’s family. There are also wishes that the person departing may have a safe journey home and that they meet no spirits or other forms of danger. A more modern Senegalese farewell is more simple and consists of sending regards to another person in the family. Otherwise, a younger Senegalese may simply say “Ciao” or the French version of “See you later” even if people are not going to see each other for a long time. "Hello, What is Your Last Name?" "Hello, How is Your Family?" "Introducing a Friend to a Sister"